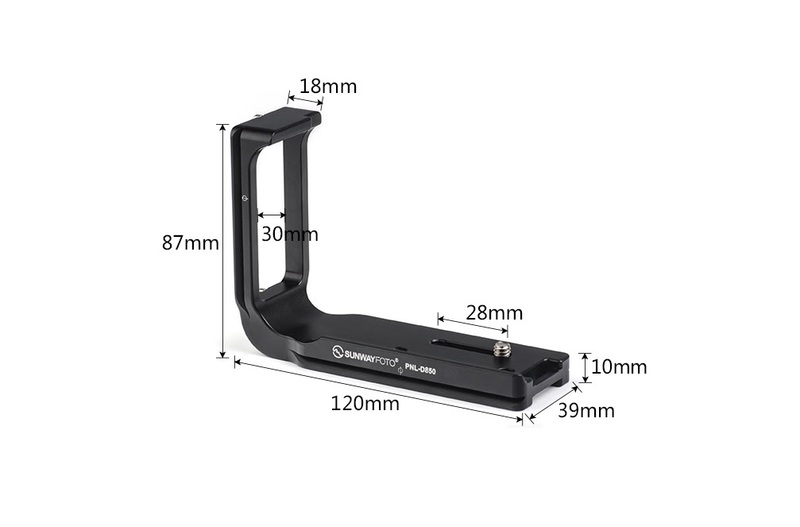 Sunwayfoto® has announced the release of their new Custom L Bracket ( Plate ) for the new high end Nikon D850 DSLR Camera. The new PNL-D850 L plate is similar to the PNL-D810R dedicated to the previous Nikon D810. Both are designed to sit a little further away from the camera side taking into account the distance required for the side connector port covers to open. In these Nikon models the side connector ports were re positioned and modified compared to the ones found on the previous D800 models. Standard characteristics shared among the Sunwayfoto plates and L brackets are met by precision CNC machining from aircraft-grade aluminium followed by high quality hard coat surface anodizing. According to the latest Sunwayfoto trend the PCL-D850 L bracket is made of one piece aluminum block maintaining utmost rigidity. 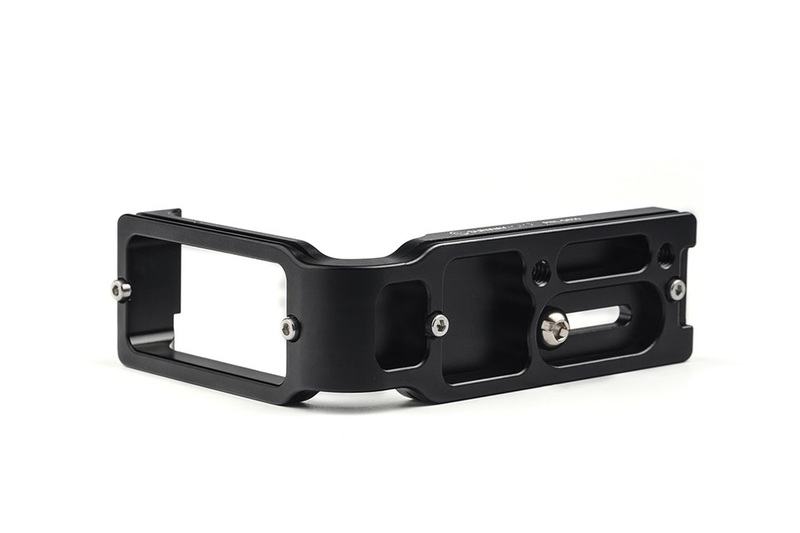 The large bottom plate is simple in design having a raised lip at the rear covering almost all the camera base in order to prevent the bracket from twisting. Two extra 1/4"-20 tapped holes are also located towards the rear of the base plate. 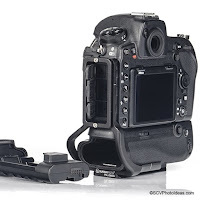 However, it needs to be pointed out here that the anti-twist lip located at the rear of the PNL-D850 base plate prohibits the use of the Nikon plastic LCD screen protector. Therefore, they can't be used simultaneously. 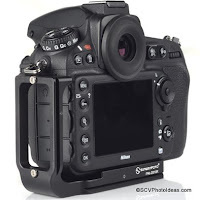 The rear side of the PNL-D850 shows the vertical plate distance and the laser engraved Φ lens centering marks on the vertical side plate and the base plate located between the Sunwayfoto logo and model name. In rear view you can also see the strap loop at the inner end of the base plate. The L bracket bottom is deeply carved where possible in order to eliminate excess material, thus keep the weight down. Quite successfully considering the 105.4 gr in total. Both the vertical side and the base plates are equipped with two M3 safety stop screws each at their dovetail ends. The base plate dovetail and the side vertical plate dovetail are aligned so there is no need for any re-framing when changing from landscape to portrait orientation and vise versa. 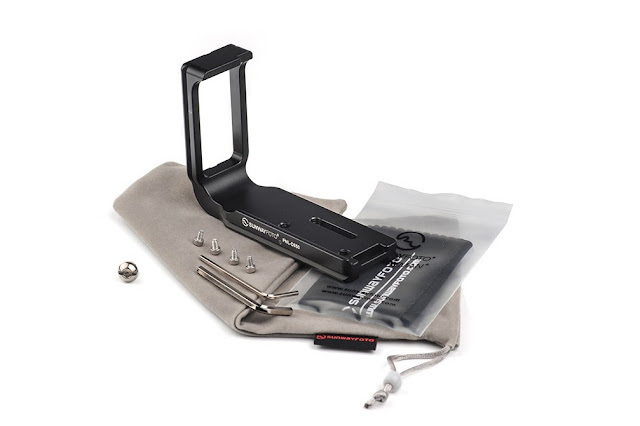 Another feature is that the hex socket 1/4"-20 mounting screw runs withing a long captive slot, that permits movement of the L bracket away from the camera side in order to accept large plugs in portrait orientation. 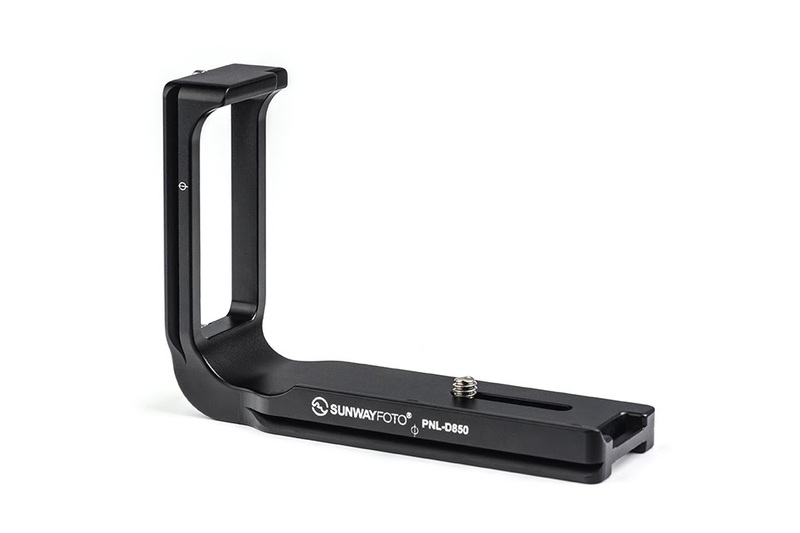 Sunwayfoto PNL-D850 L bracket bottom and side plates feature 4 safety screws. In the illustration below the exact dimensions and measurements of the L bracket are displayed. 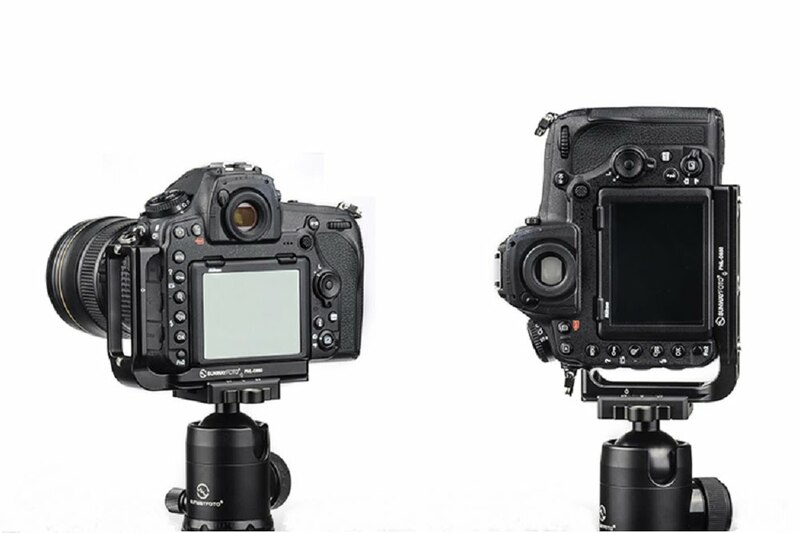 As well as the mounting screw captive slot length, which allows the vertical plate to be moved away by 28 mm from the camera side for extra clearance of the ports in portrait orientation. 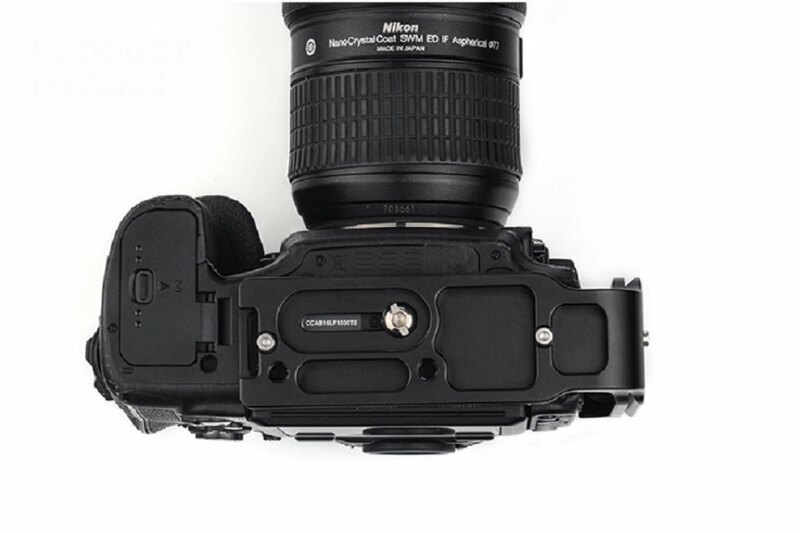 The PNL-D850 L plate fits straight on the Nikon D850 without adding much bulk and allowing full acces to the battery compartment door. Sunwayfoto PNL-D850 L bracket attached on Nikon D850 base. As mentioned in the beginning special effort has been given so as the side connector covers may be opened without the need of relocating the side plate in order to do so. 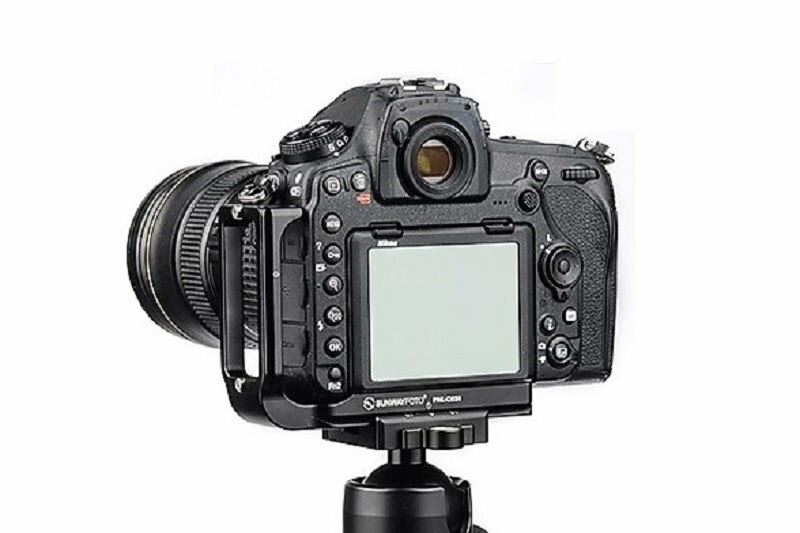 Nikon D850 with Sunwayfoto PNL-D850 L bracket in landscape and portrait orientation. 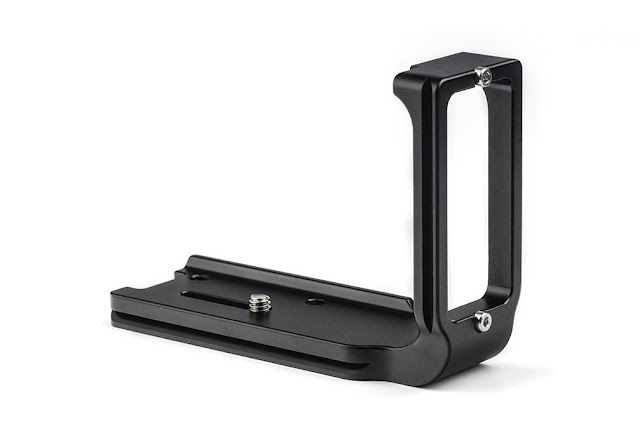 On the other hand the 28 mm long captive slot on the base plate allows the adjustment of the bracket by placing the vertical side plate in adequate distance from the camera side so the side connectors can accommodate cables with larger or longer jacks for tethered shooting in portrait orientation. 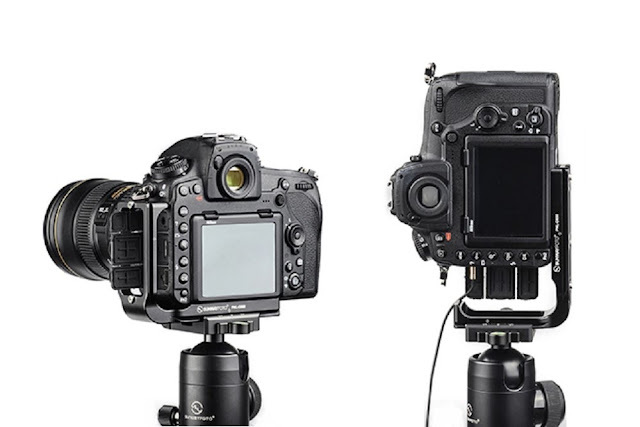 Nikon D850 with Sunwayfoto PNL-D850 L bracket in landscape and portrait orientation with open connector ports. The PNL-D850 package, besides the L bracket it also contains all necessary screws and tools. In this case 4 x M3 safety stop screws for the bottom and side plates, 1 x 1/4"-20 captive screw and 2 x Allen wrenches 2.5mm for the M3 screws and 4mm for the 1/4"-20 screw respectively. As of last year the geometry of all Sunwayfoto dovetails has changed. Therefore, in this respect the PNL-D850 is compatible with almost all Arca style clamps including RRS lever release clamps.